North Korean political leader, chief of state of the Democratic People's Republic of Korea (1948–94); originally named Kim Sung Chu. While fighting Japanese occupation forces in the 1930s, he adopted the name Kim Il Sung after a famous Korean guerrilla leader of the early 20th cent. He was trained in Moscow before World War II, and in 1945 he became chairman of the Soviet-sponsored People's Committee of North Korea (later the Korean Workers' party). In 1948, when the People's Republic was established, he became its first premier. Between 1950 and 1953 he led his nation in the Korean War Korean War, conflict between Communist and non-Communist forces in Korea from June 25, 1950, to July 27, 1953. At the end of World War II, Korea was divided at the 38th parallel into Soviet (North Korean) and U.S. (South Korean) zones of occupation. In 1948 rival governments were established: The Republic of Korea was proclaimed in the South and the People's Democratic Republic of Korea in the North. 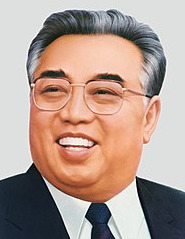 In 1972 he relinquished the premiership but retained his position as North Korea's leader by assuming the presidency under a revised constitution. Under his rule, North Korea increased its military forces, embarked on a program of industrialization, and maintained close relations with both China and the Soviet Union.